Students in a “Reacting to the Past” course, each in the role of a historical figure, replay a scenario from a century ago in New York City. Cierra Womack is no anarchist. Andrew Voitik is no Catholic cardinal. But they played these people in history class. They weren’t acting, really. More a matter of learning to think like these historical figures thought and to voice their ideas and arguments. Other classmates filled other roles, and together they replayed historic clashes of ideas and personalities – but with no predetermined outcome. It’s called “Reacting to the Past,” a game concept developed at Barnard College and recently introduced by the history department at Illinois. Think of it as a kind of improv history. A Reacting scenario might take you to Massachusetts in the early 1600s, when the trial of a religious dissenter threatened to destroy the Puritan colony. Or to the Greenwich Village neighborhood of New York City prior to World War I, where a potent mix of artists, activists and suffragists debated issues of race, labor and the role of women. Both games were part of an American history course taught last fall by doctoral student Leanna Duncan. Other scenarios might take you to Galileo’s trial in 17th century Rome or to an Oxford University debate in 1860 over Charles Darwin’s theory of evolution – both part of a science history course taught last fall by doctoral student Peter Thompson. 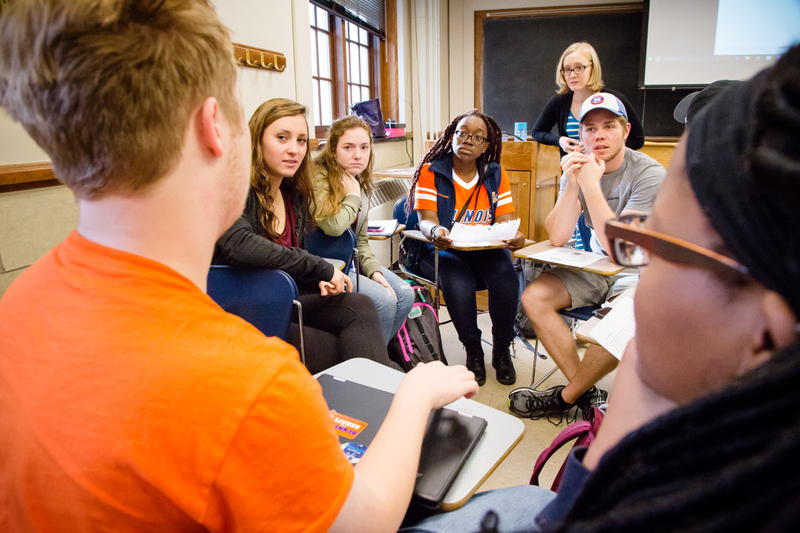 Reacting is “a totally different way of teaching,” said Clare Crowston, the history department chair and one of three professors who initially promoted its use. A professor at another school had given her a “glowing” description about how the games engaged students, and so she tried a game set in the French Revolution. The students were certainly engaged – and loud. Womack, a junior in communication from Lansing, Illinois, said she spoke to a number of friends about Duncan’s American history course, especially after she got to play anarchist Emma Goldman in Greenwich Village. Prior to college, she wrongly thought history was “just all about memorization,” and it was not her strong suit. But now she would be looking to take more of it, even in traditional courses. Part of what students are learning, Duncan said, is that history is not just about sources and facts, but interpretation and argument. Not only are they forced to identify with their characters’ views, they also must draw from the same common texts of the time to make opposing arguments. “When a student has to take a side on an issue and argue for it, against those who oppose it, they are more likely to get a strong understanding of what is actually involved,” Duncan said. “Looking at it in hindsight, it’s a lot easier for us to pick apart who was right and who was wrong,” he said, but things were not so clear then. Reacting courses may not be for everyone. Womack is part of a theater group on campus and so enjoyed taking on a role. Voitik liked the competitive aspect of it. Students who are not competitive or self-motivated may find the format intimidating or a turnoff, Thompson said. It’s not a class where you can easily sit back. But that doesn’t mean you need to be an extrovert. Duncan has found that those who thrive are often the best listeners and those most willing to seek help, not necessarily the most outspoken. What some students may find uncomfortable, both Voitik and Womack observed, is replaying scenarios set closer to the present, rather than centuries in the past. The 1860 Oxford debate on evolution dealt with issues of racism, sexism and religious conflict “that we’re still dealing with,” Voitik said. Some might argue that’s just one more reason to study history.